The are many lawn pests, most of which will be under the turf, eating the grass roots. You could have 100-200 larvae per square metre with a really bad infestation. Chafer Beetle and Leatherjacket Larvae will literally strip a lawn bare of grass cover and sadly, there are no pesticide control products to control them thanks to The Ministers in the EU Parliament. Your only option is to go for Biological control using Nematode worms which seek out their specific host and eliminate them. Leatherjackets live in the soil only for one year whereas Chafer Beetles live in the soil for up to three years making them harder to eradicate. Larger Mammals like Badgers and Foxes and also Birds will see the lawn grubs as rich sources of food when times are tough and they will all seriously rip up the turf to get to the grubs, making a right mess of the lawn surface and make it hard to repair it. Moles may also be a problem in allowing you to maintain a nice green sward. Quality, not quantity is the key. When and how much water should you give your lawn in the summer months? Should you water your lawns or not in the dry summer? We can also get dry Springs and Autumns. The natural water loss from the lawn can be 7mm per hour when the temperature is 29 degrees and 4mm per hour when it is 24 degrees. We say no, don’t bother and water your plants instead before there is a hosepipe ban. If you have to water a lawn, water at the coolest part of the day and do not water until run off. Use a wetting agent to solve dry patches in the lawn. 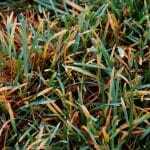 The more healthy your turf grasses are, the best they will survive a dry spell. Weed grasses react violently with big changes in climatic conditions. Weeds in the sward take up a lot of precious water intended for the grass plants. Remember one thing – you cannot beat natural rain for evenly watering a lawn to a depth. A healthy lawns should not have any weeds in it. Let’s say that again, a lawn should not have any weeds in it. Weeds compete for vital water with the turf grasses plus they look unsightly and grow faster than the grasses so you will increase your mowing frequency to suit the weed growth. Some larger rosette weeds can be easily dug out but the finer weeds are best sprayed with a Selective Weed Killer with a garden sprayer. Always apply a liquid or granular weed killer three or four days after mowing and do not mow for a few days after, longer if you can get away with it. It will take a few weed control sessions to finally rid of the weeds and not all lawn weeds are easy to kill, especially Parsley Piert, Speedwells and Field Woodrush. Some weeds are best controlled by using a Soluble Iron used for Moss Control rather than a Lawn Weed Killer. Always make sure that your sprayer is clean and calibrated correctly before mixing a treatment up. A Wetting Agent lowers the surface tension of water thus making it wetter. Soil naturally suffers from a condition called ‘Dry Patch’. 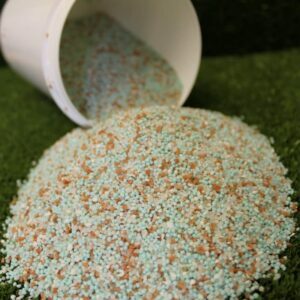 A programme of Wetting Agent Applications will alleviate the condition and ensure the percolation of any water natural or artificial, through the soil profile. It will conserve water if the water moisture content is consistent down the soil profile. It will conserve water by making sure that any available water will not run off and be wasted. Can be added to irrigation systems too. 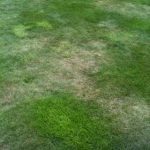 Dry Patch is a little known problem of turf in amateur lawn circles but one that has an incredible impact in ensuring consistent colour, growth, nutrient status, run of the ball and most of all visual impact and continuity of grass cover. Dry patches that are hard to re-wet are the primary causes of lawn failure. If a lawn is renovated, it is always these long lasting dry areas that are the root cause of any seed failing to germinate and establish in these well marked and visual areas. You may notice a darkening halo on parts of the lawn, visible from the upstairs window. This is a good indicator that the soil underneath is starting to or has dried out. This little known phenomenon is not only related to drought conditions but even if you are watering the lawn on a regular basis all throughout the year, some areas will still never become wet naturally to a depth, thus promoting grass growth in these areas. The surface of these areas will become dry and crusty and thatchy and be void of grass that cannot grow without water. A Wetting Agent is used to alleviate localised ‘Dry Patch’ areas on a lawn or grass area. These areas have appeared because the soil-acting bacteria have made the soil hydrophobic (repelling water) and until you can get these areas wet again, nothing will grow. Trying to wet an old bathroom sponge, almost impossible. A by-product of their activity in breaking down thatch in the lawns surface is a waxy substance that coats the soil particles, thus preventing them absorbing available water. It is important to get the lawns surface wet to a depth and consistently even across the complete surface area of the lawn to aid uniform growth and colour and make treatments effective. The Wetting Agent or Surfactant will reduce the surface tension of the water droplet and make water wetter making it easier to be absorbed into the soil and break down the waxy coating surrounding some of the soil particles. 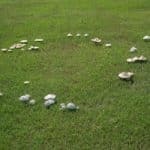 It is particularly good at reducing the activity of Fairy Rings by enabling you to get the soil in the immediate and not so immediate proximity of the fairy ring wet again. It is a liquid detergent that is safe to use on grass of a minimal salt content. Wetting Agents are available as a tablet that can be applied via a hose end diluter (like the Miracle Grow one shown) or in a liquid or granular form. If the grass trying to grow in these dry patch areas is dead, it is unlikely to come back if it is totally dead so some localised over sowing will be required. Nothing will grow in the garden without water! 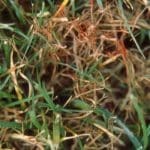 So if you have an area of your lawn that is failing to respond to fertiliser applications, over seeding and some general renovation and TLC, then it is probably a Dry Patch problem. Get the soil wet again and you should be able to grow grass in these areas once again. 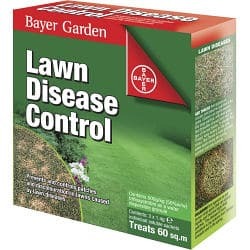 I use mine for general plant watering too and also for getting wet dog urine burns on the lawn just prior to and after seeding. Turf Managers will apply a Wetting Agent to their turf monthly during the period March to September, often with a Seaweed soil conditioner as a tank mixture. Making an application of a Wetting Agent to the turf way ahead before the soil dries out as a result of drought, will make any available water applied as a result of artificial irrigation or natural rainfall, will make the water wetter and ensure the even penetration of that water down through the soil profile. It is possible to obtain a liquid wetting agent that can be dispensed via a side dispenser into the irrigation system. The products are safe for plants and you will in fact require less water as the wetting agent makes water wetter, making it possible to penetrate dry soils easier. 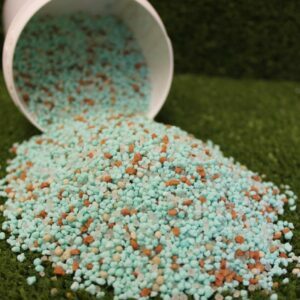 They are quite effective products, one litre can treat 18 golf greens for example so if an irrigation system has a 100-litre diluter, you would only require a small quantity each month to be dispensed around the garden. Localised problematic areas should be treated by hand to cure the problem as irrigation systems do not always provide 100% coverage across a lawn. This can be achieved via a hose diluter and Wetting agents are also available in a granular form that is incorporated following aeration via a rotary fertiliser spreader. They can be applied diluted with water as a liquid spray via a knapsack sprayer too. Larger tablets the size of a small bucket can be introduced to the water inflow of an irrigation water storage tank. If you have dying areas of grass on your lawn or areas that just will not grow, put your gardening knife into firstly a green area after watering or rainfall and then the problem area and cut out a small cube of lawn and you will notice that the dead or problem area is dust dry, much unlike the green area. Apply a wetting agent to these problem areas to solve the problem, but follow the procedure mentioned above. Need help with your Late Summer lawn? Lawn Advice Blog – I’m looking for a bit of advice and you folks seem like experts! Your blog is great and I’ll share it with friends and family. "There is so much to learn about lawns"
There is so much to know about lawns… I never knew there was so much to learn about caring for a lawn. The lawn blog is a fantastic resource and it has allowed me the opportunity to learn so much about my lawn and to realise that I was getting the flow chart all wrong. Now I have the correct advice and access to some excellent lawn products too, it is looking so much better already. Thank you for your advice and products. I will certainly be recommending your company to my friends. Lawn Renovation – My lawn is transformed, please thank your team of lawn specialists who transformed it. "Never will we let our lawn down again…"
Lawn Weed Killer – the weeds went into super growth and I thought that the weed killer was meant to kill them not feed them. Then two weeks later they were gone! Fabulous, thanks for your helpful advice and service. "I would be pleased to recommend you to my family and colleagues"
I thought that my lawn had had it! It did look a bit poorly for a while following your renovation process but 8 weeks on looks like a lawn again. I would be pleased to recommend you to my family and colleagues.